Yes, a tale of romance in Paris. Betsoft's Bitcoin video slot works efficiently and easily on mobile phone, PC, and Tablet. First impressions of the game is a fun, beautifully designed game. The animation is in keeping with Pixar or any other animation house. 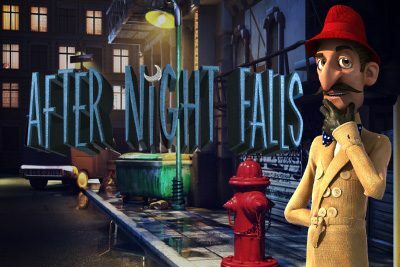 While being the city of love, this game’s theme is about a burglary planned by a petty the thief who looks like a likely villain in a heist animation. Romance aside it is time to delve into the seedier side of Parisian life. Amazing characters and animations display themselves in a 5 reel, 30 playline format which offers low volatility. 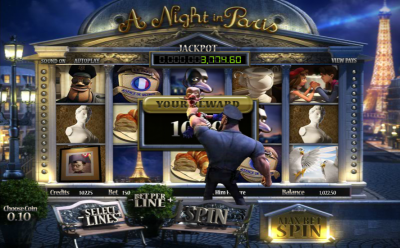 The characters are brilliantly animated, making this slot more like a movie than a slot game. The bulky security guard and his bulldog try to prevent the heist. Other symbols that reflect the Parisian style and culture, include the Eiffel Tower, a roadside cafe scene, a croissant, a sculpture, a vase, a pair of doves. The controls are a bit random in appearance but represent all the relevant controls and are easy to locate. They include Select Line, Bet per Line, Spin, Max Bet Spin. In the line above that is Info Line, Credits, Bet Balance. On the top of the screen is Sound, Autoplay and View Pay. Enjoy Paris at the leisurely pace it’s meant to be experienced because you won’t find a Turbospin! Should you get 3 or more of the Security Officers Badge in the base, it triggers free spins. When this happens, the criminal appears on the page, and he is on the run to escape the Security Guard Jermone LaBaste. This round can be retriggered. The bonuses pay well but are very difficult to get. 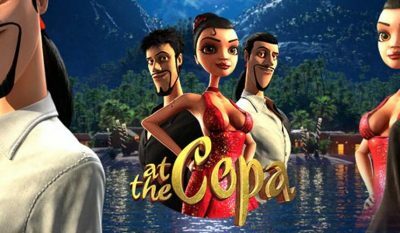 Betsoft has created a game closer to a movie than a slot. The opening story sets the tone for the rest of the game, introducing you to all its characters and locations. The feel of this game is enchanting, and while the bonuses are hard to strike, it was fun to play and the story and visual endearing. A trip to Paris, whether walking along the Champs Elysee, visiting the Eiffel Tower or stealing a painting from the Louvre, is always romantic and entertaining with hints of mystery. That sums up A night in Paris Slot. Au Revoir Paris see you again mon ami!